The Golden Apple is loosely based on a fairy-tale The Glass Mountain. Even though I’ve read a million different tales from different countries, this is one I’m not familiar with. Of course I looked it up and the basic idea is definitely in this tale. I liked the writing style in this book. It started off sounding like a traditional fairy tale and as it went on, it took on a fantasy element to it. I also think that you are an adult that enjoys YA this is a great crossover for you. It’s an adult novel but it has that YA feel about it. 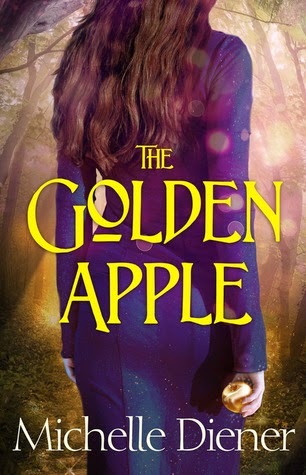 I like books like The Golden Apple where I like the main characters as much separate as I do together. That’s how I felt about Kayla and Rane. They both are feisty and funny and I like how they don’t take crap from anyone. They manage to balance each other out even when they are managing to rile the other up. I was glad to have both of their povs for the story and couldn’t help wanting them to come out victorious in the end. I thought the villains were interesting because they had different things invested in the outcomes of the story. This villain wanted this in order to do this and this one wanted something completely different. This one seems like a villain but is just trying to prevent certain things going into the wrong hands. So I liked that they had more depth than just laughing wickedly and stroking their evil beard. I thought The Golden Apple had a really great plot. I thought that it was really imaginative and intricate.. I really liked when they were in The Great Forest because it reminded me of the Wyldwood in Faery. Anything could happen, any creature could pop out. The world building in the Forest was well done. I could easily imagine it. As far as the castles outside there wasn’t as much focus but there didn’t really need to be. The ending surprised me. For some reason I thought the book was a standalone so it felt abrupt. Apparently there is going to be a sequel and I’m thankful because it couldn’t end like that. I guess it would have been difficult to do just one book because so many things happen and so many questions still need to be answered.